Beach Tennis the New Dynamic Game to hit Cancun Beaches. 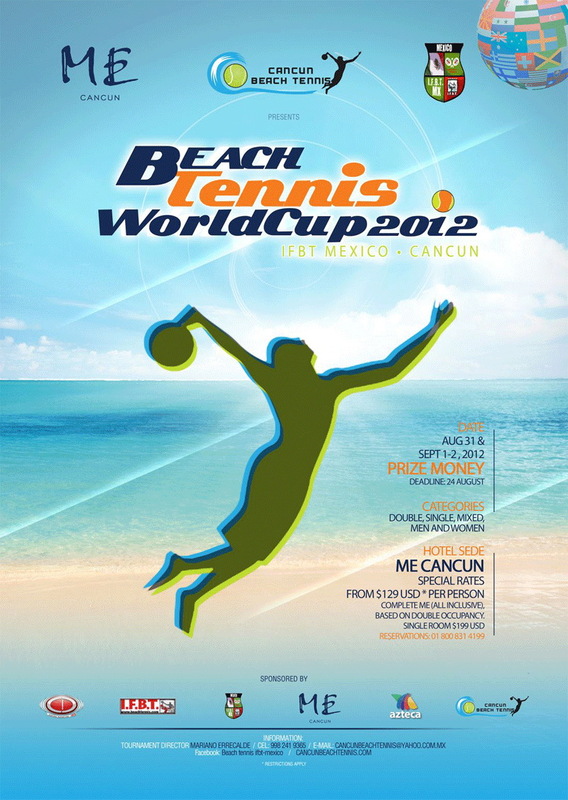 We put Sun, Sand and Surf, together with Serve, Volley and Smash! Beach Tennis is played all over the World, in Europe, North and South America, and even as far as Australia and New Zealand. Beach Tennis is easy to play for everyone, full of excitement, fun, very addictive and thrilling to watch. No better place to be than on a beautiful beach, playing Beach Tennis and chillin out. Court - similar in size to a beach volleyball court, 16m long x 8m wide; a sand surface. Net - the net is 1.7m in height. Equipment - paddle bats (no strings) and Stage 2 (low compression "orange") balls are used. Scoring - exactly the same scoring system is used as for regular tennis, except with the permanent use of no-Advantage (after Deuce), no second service and no service let. Playing the game - the game is predominantly played between doubles teams, although singles can be played on a smaller court; under and overarm serves are permitted and either member of the receiving team may receive the service; a point is won if the ball hits the ground in the opposing court or if the opponents hit (or serve) the ball out of the court or into the net. The court is a rectanglular field measuring 16m in length and 8m wide. The court is divided across the middle by a net suspended by a cord or metal cable of 0.8cm maximum diameter, which passes over or be attached to two net posts. The net shall be fully extended so that it completely fills the space between the two net posts and it must be of sufficiently small mesh to ensure that a ball cannot pass through it. The height of the net is 1.7m at the centre. A band covers the cord or metal cable and the top of the net. The lines of the court are between 2.5cm and 5cm wide, except at the baselines, which may be up to 10cm wide. All court measurements are up to the outside of the lines and all lines of the court are of the same colour clearly contrasting with the colour of the surface. The terrain must be composed of levelled sand, as flat and uniform as possible, free of rocks, shells and any other irregular objects. The playing surface must not present any danger of injury to the players. The permanent fixtures of the court include the backstops and sidestops, the spectators, the stands and seats for spectators, all other fixtures around and above the court, the chair umpire, line umpires and ball persons when in their recognized positions. Stage 2 (i.e. low compression “orange”) balls, as outlined in the ITF Approved Tennis Balls & Classified Court Surfaces Booklet, are approved for play. The racket must not exceed 50cm in length, 26cm in width and 38mm in profile width. The central part of the racket surface may have an unspecified number of 9 to 13mm diameter holes. On a maximum 4cm perimeter from the external edge of the racket, the diameter, the length and shape of the holes may be different, provided these do not have an impact on the essence of the game. The hitting surface must be flat, but may be smooth or rough and shall not exceed 30cm in length and 26 cm in width. A match can be played to the best of 3 sets (a doubles team needs to win 2 sets to win the match) or to the best of 5 sets (a doubles team needs to win 3 sets to win the match). The chosen format must be announced in advance of the event. There are different methods of scoring in a set. The two main methods are the“Advantage Set” and the “Tie-break Set”. Either method may be used provided that the one to be used is announced in advance of the event. If the “Tie-break Set” method is to be used, it must also be announced whether the final set will be played as a “Tie-break Set” or an “Advantage Set”. The first doubles team to win six games wins that “Set”, provided there is a margin of two games over the opposing doubles team. If necessary, the set shall continue until this margin is achieved. The first doubles team to win six games wins that “Set”, provided there is a margin of two games over the opposing doubles team. If the score reaches six games all, a tie-break game shall be played. Additional approved alternative scoring methods can be found in Appendix IV of the Rules of Tennis. In the absence of a chair umpire, the game score must be called by the server before the start of each point. If both teams have won three points each, the score is “Deuce” and a deciding point shall be played. The team who wins the deciding point wins the “Game”. During a tie-break game, points are scored “Zero”, “1”, “2”, “3”, etc. The first doubles team to win seven points wins the “Game” and “Set”, provided there is a margin of two points over the opponents. If necessary, the tie-break game shall continue until this margin is achieved. The player whose turn it is to serve shall serve the first point of the tie-break game. The following two points shall be served by the player of the opposing doubles team due to serve next. After this the rotation of service within each team shall continue in the same order as during that set until the end of the tie-break game. Additional approved alternative scoring methods, as outlined in Appendix IV of the Rules of Tennis, may be used provided that the one to be used is announced in advance of the event. The doubles teams shall stand on opposite sides of the net. The server is the player who puts the ball into play for the first point. Players in the doubles team that is ready to return the ball served by the server shall be the receivers. Before the start of each point the receivers shall first take their positions, followed thereafter by the server who will then serve. The receivers may not significantly alter their positions relative to each other and the server once the server has chosen his position. Case 1. Are the members of the receiving doubles team allowed to stand outside the lines of the court? Decision: Yes. The members of the receiving doubles team may take any position inside or outside the lines on the receiving side of the net. Case 2. Can the partner of the player serving stand in a position which hinders the view of the members of the doubles team returning the serve? Decision: Yes. The partner of the player serving may take any position inside or outside the lines on the serving side of the net. Case 3. Will a player who runs after a ball lose the point for his/her doubles team if he/she crosses the line which runs parallel to the net, but outside the lines of the court, prior to or after hitting the ball? Decision. No. A player will only lose the point for his/her doubles team if he/she steps into the opposing team’s playing area prior to or after hitting the ball. Case 4: Is one member of a doubles team allowed to play alone against the opponents? c. To require the opposing team to make one of the above choices. Case 1. Do both doubles teams have the right to new choices if the warm-up is stopped and the players leave the court? Decision: Yes. The result of the original toss stands, but new choices may be made by both doubles teams. Doubles teams shall change ends at the end of the first, third and every subsequent odd game of each set. Doubles teams shall also change ends at the end of each set unless the total number of games in that set is even, in which case doubles teams change ends at the end of the first game of the next set. During a tie-break game, doubles teams shall change ends after every four points. If a ball touches a line, it is regarded as touching the court bounded by that line. In case of a change in the position of any line, prior to the start of a point members of a doubles team may request the umpire to make taut the line (this may be done by a player in the case of a match without an umpire), but any such adjustment will not impact on the outcome of any previous point. If the ball in play touches a permanent fixture before it hits the ground, the player who hit the ball loses the point for his/her team. The doubles team due to serve in the first game of each set shall decide which member of that doubles team shall serve for that game. Similarly, before the second games starts, their opponents shall decide which player shall serve for that game. The partner of the player who served in the first game shall serve in the third game and the partner of the player who served in the second game shall serve in the fourth game. This rotation shall continue until the end of the set. The ball served by the server can be returned by either player on the opposite side of the net. the racket before the ball hits the ground. The service motion is completed at the moment that the player’s racket hits or misses the ball. A player who is able to use only one arm may use the racket for the release of the ball. Case 1. If when serving the server throws two or more balls into the air, instead of one, is this a fault or does the server lose the point? Decision. On the first occasion a let shall be called and the server shall serve again, but a service let does not cancel a previous fault. On the second and any subsequent occasion, the action shall be considered deliberate and a fault shall be called. receiver returns it. There shall be no second service. In Mixed Doubles event, male players shall serve underarm. Case 1. Is the server allowed to have one or both feet off the ground? Case 2. Is it a fault if the server’s standing/front foot touches the baseline during the service motion? Decision. As long as both the server’s feet are behind the baseline prior to the start of the service motion, no foot fault is committed if his standing/front foot touches the baseline during the service motion. d. The ball served touches the server or server’s partner, or anything the server or server’s partner is wearing or carrying. Case 1. After tossing a ball to serve, the server decides not to hit it and catches it instead. Is this a fault? Decision: No. A player, who tosses the ball and then decides not to hit it, is allowed to catch the ball with the hand or the racket, or to let it fall to the ground. The server shall not serve until the members of the doubles team receiving are ready. However, the members of the receiving doubles team shall play to the reasonable pace of the server and shall be ready to receive within a reasonable time of the server being ready. A service that touches the net, strap or band is in play (no let rule). In all cases when a let is called the point shall be replayed. Case 1: If the ball is broken during the playing of a point should a let be called? Case 2: If, during the playing of a point, one of the lines on the playing area is broken or becomes unattached should a let be called? Case 3: If either member of the receiving doubles team is not ready when the ball is served should a let be called? k. Both members of a doubles team touch the ball when returning it. the net before the ball hits the ground. Case 1: A member of the receiving doubles team touches the net before the ball that has been served touches the ground outside the correct court. What is the correct decision? Decision: The receiving doubles team loses the point because one of them touched the net while the ball was in play. Case 2: Does a doubles team lose the point if an imaginary line in the extension of the net is crossed before or after hitting the ball? Decision: The doubles team does not lose the point in either case provided a member of that doubles team does not touch the opposing team’s court. Case 3: Is a member of a doubles team allowed to jump over the net into the opposing team’s court while the ball is in play? Decision: No. The doubles team loses the point. Case 4: A player throws the racket at the ball in play. Both the racket and the ball land in the court on the opposing doubles team’s side of the net and the members of the opposing doubles team are unable to reach the ball. Which doubles team wins the point? Decision: The doubles team throwing the racket at the ball loses the point. Case 5: A ball that has just been served hits either member of the receiving doubles team before it hits the ground. Which doubles team wins the point? Decision: The server wins the point. Case 6: A member of a doubles team standing outside the court hits the ball or catches it before it hits the ground and claims the point because the ball was definitely going out of the correct court. Decision: The doubles team loses the point, unless it is a good return, in which case the point continues. d. A member of a doubles team hits the ball in play, which hits another ball lying in the correct court. If a member of a doubles team is hindered in playing the point by a deliberate act of a member of the opposing doubles team, that doubles team shall win the point. However, the point shall be replayed if a member of a doubles team is hindered in playing the point by either an unintentional act of a member of the opposing doubles team, or something outside the player’s own control (not including a permanent fixture). Case 1: Is an unintentional double hit a hindrance? Case 2: A member of a doubles team claims to have stopped play because the player thought that a member of the opposing doubles team was being hindered. Is this a hindrance? Decision: No, the doubles team loses the point. Case 4: During a point, a ball or other object that was lying on the doubles team’s side of the net when the point started hinders one of the players. Is this a hindrance? Case 5: Where are the server’s partner and members of the receiving doubles team allowed to stand? Decision: The server’s partner and the members of the receiving doubles team may take any position on their own side of the net, inside or outside the court. However, if a player is creating a hindrance to a member of the opposing doubles team, the hindrance rule should be used. a. During a standard game or a tie-break game, if the doubles teams are at the wrong ends of the court, the error should be corrected as soon as it is discovered and the server shall serve from the correct end of the court according to the score. If a player serves out of turn during a standard game, the player who was originally due to serve shall serve as soon as the error is discovered. However, if a game is completed before the error is discovered the order of service shall remain as altered. b. If a player serves out of turn during a tie-break game and the error is discovered after an even number of points have been played, the error is corrected immediately. If the error is discovered after an odd number of points have been played, the order of service shall remain as altered. c. If in error a tie-break game is started at 6 games all, when it was previously agreed that the set would be an “Advantage set”, the error shall be corrected immediately if only one point has been played. If the error is discovered after the second point is in play, the set will continue as a “Tie-break set”. d. If in error a standard game is started at 6 games all, when it was previously agreed that the set would be a “Tie-break set”, the error shall be corrected immediately if only one point has been played. If the error is discovered after the second point is in play, the set will continue as an “Advantage set” until the score reaches 8 games all (or a higher even number), when a tie-break game shall be played. e. If in error an “Advantage set” or “Tie-break set” is started, when it was previously agreed that the final set would be a match tie-break, the error shall be corrected immediately if only one point has been played. If the error is discovered after the second point is in play, the set will continue either until a doubles team wins three games (and therefore the set) or until the score reaches 2 games all, when a match tie-break shall be played. However, if the error is discovered after the second point of the fifth game has started, the set will continue as a “Tie-break set”. (See Appendix IV of the Rules of Tennis). For matches where officials are appointed, their roles and responsibilities can be found in Appendix V of the Rules of Tennis. a. Between points, a maximum of twenty (20) seconds is allowed. When the doubles teams change ends at the end of a game, a maximum of ninety (90)seconds is allowed.